Stick around to around 35:40 for some special insight from the author on the origins of this tale. Rachael’s story is published in full below the player. I kept one eye on the tower from my concessions booth, The Innsmouth Look, where I served up fried calamari, sashimi, and other assorted not-so-authentic Savannah, Georgia delicacies. Of all the attractions in the park, the tower was the biggest eyesore, the sort of thing imagined by people who vaguely knew the word “Lovecraftian” but had never actually bothered to read anything by the man. The tower had a certain gothic sensibility, sure: all soaring spires and flying buttresses and period-appropriate ogivales over the windows. But the park’s designers had also slapped on fake blood, skulls, and some tacky plastic bats on strings like the kind you find in a low-budget Halloween prop shop. It completely ruined the effect. La’vonne shambled back from her meeting with the boss, still wearing her shoggoth suit, minus the hood, which made it look like the monster was devouring her feet-first. A dad trailing twin girls stopped her for a picture, but she threw him a look so withering he scooted along toward the Mountain of Madness, our most unstable roller coaster (it had a batwing inversion after its second drop, and a low center of gravity, which gave riders whiplash). “God, La’vonne. What happened?” I worked the flimsy zippers gently so they wouldn’t jump their tracks. La’vonne was far less gentle. A fabric eyeball ripped and fluttered to the floor. She kicked the torn bits underneath the counter. “He fired you for that?” La’vonne worked harder than anyone I knew. After her husband died in Iraq, she began attending design classes at SCAD. She wanted to do costume design on set for movies someday. She’d even designed some of our costumes–the shoggoths and the Mi-Go and a few of the cultists. “See where it got me.” La’vonne wiped her eyes. I thought they grossly oversold R’lyeh Funland. 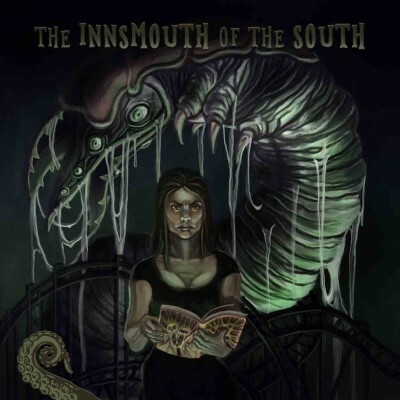 The Innsmouth of the South, Mr. Whatley called it, except he pronounced Innsmouth so it rhymed with South, and wouldn’t let anyone correct him. Not that the average tourist knew or cared. They only came because it was cheaper than a ghost tour for a family of six in downtown Savannah, and you didn’t have to pay for parking, and you could get a bumper sticker that said R’lyeh, Y’all, even if most of them didn’t get the joke. We collected Patricia and Talon from Miskatonic U, and La’vonne’s best friend Mikki from the Nameless City. On the way out the gaping tentacled demon-mouthed entrance, we passed Reverend Pete waving a Bible and shouting himself hoarse at the patrons in the ticket line. Reverend Pete wasn’t really on staff. He hailed from the local Independent Bible Church. He’d been protesting the park on grounds of Satanic influence since the day it opened. Mr. Whatley thought he added to the ambience, and besides we didn’t have to pay him anything, so he let the Reverend stay. Boss even let us walk out a complimentary water to him when the days got midsummer-hot, that sticky miserable Southern heat that made you want to die just so they’d bury you beneath a nice cool slab of marble. “No drunkard shall inherit the kingdom of God,” the Reverend said archly. “I’m bringing lemonade,” said Mikki. “I don’t mind sharing. It’d be nice to have another teetotaler in the mix.” She was three months pregnant and had given up beer. It must’ve been tiring business, being Reverend Pete. A whole theme park full of demons to condemn, but we were just regular people in costumes scraping by under a terrible boss. Hard to hate someone who offered you a lemonade. But Reverend Pete was just taking orders himself in his own way, so we didn’t mind when he quietly tagged along. We met at our favorite drinking spot by the Savannah River, where you could dangle your legs over the dock and toss back a six-pack of Terrapin Reclaimed Rye. We shared around a pound of chocolate pralines from the confectionary on River Street. Mikki split canned Minute Maid with the Reverend while La’vonne regaled us with a reenactment of her firing. Everyone had a Mr. Whatley horror story. Mikki had gotten relegated to playing a Mi-Go when she told him she was pregnant (“Nobody wants to see fat girls,” he’d said). Patricia had just been promoted to Assistant Manager, only to find she was now Mr. Whatley’s favorite scapegoat to corporate. Mr. Whatley had asked Talon to pose for some promotional photos, which Talon later found slapped across all Mr. Whatley’s online dating profiles. Even Reverend Pete had opinions on the Man of Iniquity prowling uncostumed amongst the lambs, or such. I’m not sure I followed his complaint, but it sounded pretty bad, even by Pete Standards. La’vonne just shook her head and opened another beer. I had Mr. Whatley stories for days, but none of them captured my secret resentment, the injury he’d inflicted upon my soul. “I used to like Lovecraft,” I admitted. “He was my favorite author. I’ve read the Collected Works cover to cover at least five times. I own every issue of Weird Tales with a Lovecraft story in it, the vintage ones from the 1930’s. I got a tattoo of the Yellow Sign on my palm when I graduated high school. I had a Lovecraft-themed birthday party when I was thirteen, and lost all my friends over it because their parents thought I was a Satanist. And you know what? I didn’t care, because the Mythos was awesome. Yes, Lovecraft had serious racism issues, and his expansive purple prose was surpassed only by his fear of miscegenation. Ultimately, the Mythos was bigger than the sum of its parts. I didn’t need friends who couldn’t understand that. It was probably the beer, but tears stung my eyes, and the wind dragged them out sideways. She flipped open the Necronomicon and began to read. “Pun-gluey muggle-nuff Cthulhu Real-yeah wagga-naggle fuh-thoggin!” Her Savannah drawl sapped all the terror out of it. It was terrible, and we all laughed our asses off. “You’re cute when you fhtagn,” I teased. “But that’s what it looks like,” said La’vonne. “You try and do better.” But before she could pass me the book, Reverend Pete bore down all angry-like and snatched it from her hands. He looked pissed. At first I thought we’d offended him on account of his religious beliefs, which made me feel bad, since I’d invited him. The last thing I wanted was to make him uncomfortable. I thought he was going to chuck the Necronomicon into the Savannah River, but instead he flipped it open and trailed a finger down the page. “That ain’t no way to read an invocation. I’ll show you how you do it proper.” Then he thundered out a cultist’s chant that put the rest of us to shame: “Ph’nglui mglw’nafh Cthulhu R’lyeh wgah’nagl fhtagn.” I guess all that time in the pulpit really did build talent. “Wow,” I said, because what else could you say? There was some scattered clapping. “Wow, man. Have a beer,” said Talon. “Thanks.” Reverend Pete accepted the beer, but set it down untasted. He probably didn’t have many friends and was therefore more susceptible to the forces of peer pressure. Thunder growled in the distance. “Looks like rain,” said Mikki. “I’d better scoot,” said La’vonne. We all scattered before the rain got worse. Out over the river, I thought I saw hissing steam and bubbles. A wood duck plished into the water and didn’t resurface. I pulled up my hood and walked to the bus stop, letting the thunderstorm pour over me. The raindrops felt unclean. They left a slick, oily feeling on my skin, a rank fishy odor that wouldn’t wash out even with a hot shower. I was ten minutes late to work the next morning. Mr. Whatley hunched over the kitchen counter in my booth, picking tiny white worms from sashimi with a pair of tweezers. He was a pale, curdled-looking fellow with greasy black hair, like Benedict Cumberbatch left in the sun too long. “You’re late.” He stacked the dewormed tuna slices on the cutting board. “Sorry. Power went out in last night’s storm, and it reset my alarm.” I opened the freezer to get the frozen calamari, but nasty octopus water sloshed out, wetting my shoes. Instead, a new staffer turned up, a man with the best Innsmouth fish-person costume I’d ever seen. Green scales peeked out from beneath his black hood. He’d even thought to apply latex gills to his neck, although I only caught flashes when he turned his head. He had huge, unsettling eyes that never seemed to blink enough and a voice like church bells tolling in the distance. “The master sent me to assist you,” he said. “Wilbur,” said the new guy. His eyelids blinked sideways, closing corner to corner instead of top to bottom. I’d never seen that particular special effect before, but it didn’t surprise me too much. We always had a few hires that got into character and stayed there. “Nice job on the eyes,” I said. He took the plate of worm bits and scraped them into his mouth, licking the platter clean. Wilbur just smiled at me, blinked sideways, and straightened the soy sauce packets up front. At least he was good with the customers. Mr. Whatley must’ve hired a bunch of people after his firings the other day, or else Patricia had carried through with her threat to recruit Craigslist randos. I ran into a lot of unfamiliar sorts who’d been let loose without a proper orientation. Over at the Non-Euclidean Nightmare Plane (a Hall of Mirrors with some gelatinous animatronic fungi suspended from the ceiling), the lights had broken so you just got a few flickers in the center of the maze. And some greenhorn was stalking tourists, scratching at the walls and panting until they ran out raving. There was more of the same all over the park. Too many shoggoths. Too many cultists. Everyone terrorizing the tourists willy-nilly until they thinned out, and it was just employees milling around, not exactly pulling their own weight when it came to puke cleanup. After lunch, I caught Wilbur in the kitchen chewing on La’vonne’s discarded shoggoth suit, which had soaked up a bunch of octopus water because I’d forgotten she’d stashed it on the floor. Wilbur stopped gnawing on the fake eyeball and blinked sideways with those too-wide eyes. “It tastes like one of the others,” he said. “Look, I love this place as much as anyone, but you’ve got to knock that off when you’re in employee areas or nobody will take you seriously,” I told him. The torn velcro shoggoth eyeballs stuck to my sleeves. Outside the booth, the loudspeakers crackled, announcing the midday Esoteric Order of Dagon Parade. Wilbur’s eyes widened until it looked like they might roll out. “We have been summoned. To the tower!” He flung open the door and charged toward Mr. Whatley’s office. But everything had gone all wrong outside. Huge crowds of people streamed toward the tower, all wearing the cheap monogrammed cultist bathrobes the gift shop sold. I couldn’t tell the staffers from the tourists anymore. It looked like the midday parade, another Dagon sacrifice, except I didn’t see any High Priestess leading the iä! iä! chorus. Above the tower, thunderheads gathered and swirled, heavy and violet. Flecks of rain pattered into the dirt. The droplets held their shape like Jell-o. I nudged one with my boot. It quivered and hissed against the rubber, burning a hole in the toe. Acid. No way that was special effects. I pushed and shoved a path through the ecstatic, chanting cultists. The crowd thinned as we approached the tower. That’s when I spotted La’vonne standing on the landing beneath the flying buttresses and fake bats, shouting at Mr. Whatley. “Just try to prove it. Take my property and the police will be at your door. Who do you think they’ll believe anyway?” He spun on his foot and tried to slam the faux-stone office door, but La’vonne wedged her foot in. “I’m warning you,” she said. Thunder boomed again. As one, all the cultists began chanting. I didn’t recognize the words. It wasn’t the famous Cthulhu chant we always did, but something inhuman, produced deep in the throat with not enough vowels and too many apostrophes for comfort. It made my skin crawl. The whirling thunderheads coalesced to a point like the pupil of a great eye. The aperture split open, drawing back, unveiling a dark that was darker than any earthly twilight of prehistoric caves winding through the rocks like the tracks of ancient worms. No, this was darkness that destroyed all hope, the dark that dwelled beyond the gates of time and space. Something awful slithered from that darkness, something long and white and covered in ichorous slime. It crawled around and around the tower, knocking down the fake bats, cutting into the cheap plastic facade with thousands of hook-tipped legs. Huge tusklike teeth, serrated on all sides, stuck out from what must be its head. I searched through all the Lovecraft stories I could remember, trying to identify this thing. Yhashtur, worm-god of the Lords of Thule, rival of Nyarlethhotep? Crom Cruach? Idh-yaa, Bride of Cthulhu? Rlim Shaikorth, the White Worm? Lovecraft sure loved his worm-gods. It didn’t matter, because the horror had slithered between La’vonne and Mr. Whatley. She fell backward, scrambled on her hands to my side. To my surprise, I realized the others had joined us too: Patricia, Mikki, Talon, and even Reverend Pete, who wasn’t wearing a wristband and therefore was technically trespassing. “It knows we summoned it,” whispered Pete. “We spake the words. Blood calls to blood.” In the right time and place, Pete would’ve made an excellent cultist. He had the proper skill set. “Pretty sure that’s not Cthulhu,” said Mikki. Everyone expected me to do something. Even the cultists, who had a whole evil god to ogle. It sucked being a hero of a Lovecraft story, because your only options were to get eaten or go mad, and I liked my body and brain intact, thankyouverymuch. The real fun of Lovecraft was gawking at those poor saps, and feeling relieved it wasn’t you. I approached the two creatures oozing from the tower. One was a pale, gibbering blight upon nature, monstrously indifferent to all human suffering it caused. The other was an Elder God. “O Great One! We are but humble servants, unworthy of your attention. We summoned you, o Great One, at the behest of our master, who stands there at the foot of his dark tower!” I pointed a finger at Mr. Whatley. It would’ve been more dramatic without the shoggoth eyeballs velcroed to my arm. But the great Worm wasn’t buying what I was selling, because it unfurled its proboscis and spat more sizzling gelatinous acid, which melted some of the plastic bats littering the ground around the tower. That might’ve begun my descent into madness or excruciating death, had it not been for Reverend Pete. I’d never seen the man so full of fight. Hellfire danced in his eyes and his Bible looked twice as big–wait, no. It was just a gift shop Necronomicon. “Woe!” he thundered, his voice bouncing and echoing off all the park’s cheap facades. “Woe to the false shepherd that destroys and scatter the sheep of the pasture! Wherefore his way shall be unto him as slippery ways in the darkness: he shall be driven on, and fall therein.” He threw the Necronomicon toward the tower. It whistled right under the creature’s slithering bulk and flopped open at Mr. Whatley’s feet. All those pretty “shalls” and “woes” succeeded where I’d failed. Even monstrous worm-creatures know that mad doomsday prophets always tell the truth. It twitched its big head around to look at Mr. Whatley, who was trying to slam the door shut again. The creature tore the door off its hinges with one hooked leg. But he was the one standing in the dark tower, so it was like blaming your farts on the dog when you only had a Roomba. The nightmarish worm bestowed upon him the ultimate reward, and devoured him. It was every inch as gruesome as you can imagine. Through the monster’s translucent skin, you could see bits of Mr. Whatley traveling through its digestive tract piece by piece, ahead of the rest of Mr. Whatley, who gawked and screamed, watching his own progression. It looked a little like roller coaster carts climbing up and up the tower. When it had finished its meal, the worm crawled right into the managerial tower, pulling the broken door closed behind it. The swirling storm crackled out and disbursed. The sun even came out. I’m pretty sure I saw a rainbow. At that point it seemed safe to clock out and head home for the night. So we did. When your boss dies from Necronomicon-related causes at a Lovecraft theme park, it’s hard to decide whether you should return to clean out your locker in the morning, or just sleep in and update your resume. I guess my dedication for all things Lovecraftian won out, because I drove back to the park just a couple hours late for my shift. The ticket line ran out the doors and down the sidewalk. I’d never seen so many patrons. Reverend Pete worked the line with a shiny new gold-edged Bible and his very best doomsday voice. I’d never seen him so happy. He could finally rail against an actual demonic monster, and he wasn’t about to waste the opportunity. “What happened to the monster?” I asked Pete. “No, Pete, we already had the hand stamps before,” I told him, but nothing I said was going to kill his joy today. Mikki and Patricia cordoned off the entrance to the tower, but left space for tourists who wanted a good photo op. Even though the new management was a nightmare creature which hailed from an unknown terror-realm, it brought a lot of positive changes to the park, enough so corporate never made a fuss about Mr. Whatley’s absence, especially since they didn’t have to pay it. Its cultist retinue made staffing issues a problem of the past. Those of us who cared about paychecks got raises. La’vonne played Asenath Waites while she applied to costuming jobs, and now she’s out in Los Angeles doing zombies for next summer’s blockbuster hit. I miss her, but she’s invited me to visit when I can. Patricia ranked highest on the managerial ladder, so she assumed most of Mr. Whatley’s responsibilities, like making the schedule and payroll, although not his office. Mikki quit the park altogether after her baby was born and took a gig doing ghost tours. They paid better, and you could collect tips from drunk tourists. As for me, I’ve handed off The Innsmouth Look to Talon and so I can take over ride design. I want to build a coaster called The Lurking Fear around the Worm’s tower. It’s going to be red carts in a clear structure climbing up and rushing down and inverting at the doorstep, so your stomach falls into your shoes when you just glimpse something pulsing and slithering inside the gray webbed cocoon. Only I know better than to get too close. After all, at R’lyeh Funland, you never enter the tower–unless summoned.